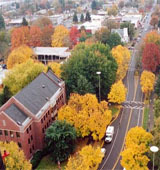 Would you believe that Western Oregon, located in Monmouth near the state capital of Salem, is the state's oldest university? It's true. The college is divided into two schools: Liberal Arts and Sciences and the School of Education, a renowned leader in educational research. If you stop in for a visit, be sure to check out the campus's beloved giant sequoia, planted back in 1887. Describe the type of student who should not attend Western Oregon University and explain why. Students who do not enjoy small towns and would rather be in the city should not attend Western. Students who also like to be surrounded by a bunch of people would not enjoy the small town and population. Describe the type of student who should attend Western Oregon University. Why? What is a typical Western Oregon University student like? Describe the type of person that should attend Western Oregon University. What are the top 3 reasons someone should attend Western Oregon University? They have an excellent education program, they are a small school, smaller classes and it's a tight knit community. What was a typical Western Oregon University student like in high school? Describe the type of person that should attend Western Oregon University. Western Oregon University (WOU), steadily emerging as a leading comprehensive public liberal arts institution, is committed to changing lives, strengthening communities and transforming our world. Located in the Monmouth-Independence area, the heart of Oregon's lush Willamette Valley, WOU is about 20 minutes from Salem, the state's capital and about 75 minutes from Portland, the state's cultural hub. What are the top 3 things that students do for fun at Western Oregon University? 47% of students received Pell Grants, which are provided by the U.S. government to students from middle and lower income families. It gives you an idea of a school’s socio-economic diversity. 26% of students live on-campus. A program that prepares individuals to study and master the performance and composition of Jazz. Includes instruction in the history of Jazz and related musical styles such as the Blues, Jazz composition and theory, improvisation, Jazz instrument and ensemble performance, and related topics. A program that focuses on the application of educational and communications principles and methods to the promotion of preventive health measures and the education of targeted populations on health issues, and prepares individuals to function as public health educators and health promotion specialists. Includes instruction in human development, health issues across the life span, population-specific health issues, principles and methods of public health education, administration of health education campaigns and programs, evaluation methods, public communications, and applications to specific public health subjects and issues. A program with a combined or undifferentiated focus on one or more of the physical and biological sciences. A program that prepares individuals to plan and manage institutional facilities and programs for housing and rehabilitating prisoners in the public and/or private sectors. Includes instruction in the principles and practice of correction, facilities planning and management, safety and security, social and health services, staff and inmate management, budgeting, communication skills, correctional psychology, and applications to specific types of correctional facilities approaches. 32% of students graduated in the top quarter of their class. 11% of students graduated in the top tenth of their class. The average student pays $15,828 for tuition, fees, and other expenses, after grants and scholarships. Total stated tuition is $7,125, in-state and on-campus, before financial aid. Learn more about financial aid at http://www.wou.edu/student/finaid/index.php. Estimate the net price for you at http://wou.edu/student/finaid/tuition_fees/net_price_calculator.php. 69% of full time students continued studying at this school after freshman year. The typical (median) early career salary of Western Oregon University graduates is $38,000, according to Payscale. Western Oregon University participates in the NCAA Division II for college athletics. Want more info about Western Oregon University? Get free advice from education experts and Noodle community members. What happened to the school counseling licensure program? For the best information about Western Oregon University's education degree programs, contact Division of Teacher Education either via email or at 503-838-8471. Additional information is also available on the WOU Division of Teacher Education's website. Hope this helps! How can I see what business classes are available? You can find the real-time availability of all classes at Western Oregon University by visiting the school's class finder. The search engine allows you to sort according to department, term, and course level. Does Debby Burnham still work in the bookstore? According the Western Oregon University directory, Debby Burnham is still listed as an employee in the bookstore division.